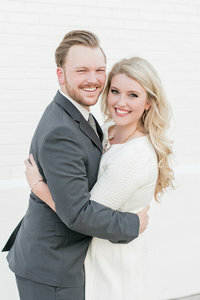 Elizabeth and Mark’s relationship goes all the way back to Mountain Brook High School and has taken them through college, different cities, first jobs, and all the way to the wedding day! These two are truly the best of friends, and that is so evident in their photos. The way they dance and laugh together is such a joy to watch, and Mark’s face during their first look and as his bride walked down the aisle to him will pull at anyone’s heart strings. Then, after their first kiss as man and wife, these two danced down the aisle, and watching them celebrate their marriage was so amazing to watch! Birmingham’s Botanical Gardens was a perfect setting for such a joyful, heartfelt ceremony. And then, the reception may have been the most lively event we’ve ever photographed. The dance floor was never empty, and we’re pretty sure you could hear Elizabeth, Mark, and their wedding guests singing at the top of their lungs all over the city of Birmingham! It was so much fun. Elizabeth and Mark, thank you for allowing us to have a front row seat of the most important day of your lives. Your relationship and the deep friendship the two of you share is inspiring! You two are truly something special, and we’re so lucky to know you both! Congratulations, Mr. and Mrs. Hammontree!